I am Jen, I am 35 yrs old and I am married with 4 young daughters. I am a high school track & cross country coach and a personal trainer for adult runners to help them improve their times. I am passionate about running (but it was not always that way). This is my running history, I started running in California when I was young and continued on in to high school. It is there where I learned and loved to compete. With my fastest time in the 1500 being 4:47 I was looked at by many universities. But unfortunatley at this time I was starting to feel burnt out from running and started seeing my times increase. So to avoid the pressure of any big university I chose to run for a junior college instead. After about a year of attending the junior college I decided to move to Utah to continue my education. I continued to run but not competitivley. I continued to feel sluggish as I did that senior year of high school. Then on Christmas day of 2001 driving home from work from the local ski resort I was in an accident. Heading down the canyon I drove over black ice that spun my Honda Civic out of control into the middle mediam. The impact force then caused my car to slide across the road on to the shoulder hitting the gaurd rail. Although, the momentum was great enough to rip the rail out if its anchors and it folded on its self. This caused a strengthing effect and the doubled up metal pushed through the front passenger side and out through the drivers door. The guard rail tore through the door of the Civic and out the otherside taking the seats with it. Miraculously leaving only one piece of precious cargo, ….me. Once the enertia ceased I was left sitting on top of the doubled up guard rail pinned against the steering wheel, legs caught between the clutch and the brake. It was truly a miracle I survived. The damage, although for me a runner was very serious, was very minimal and superficial. 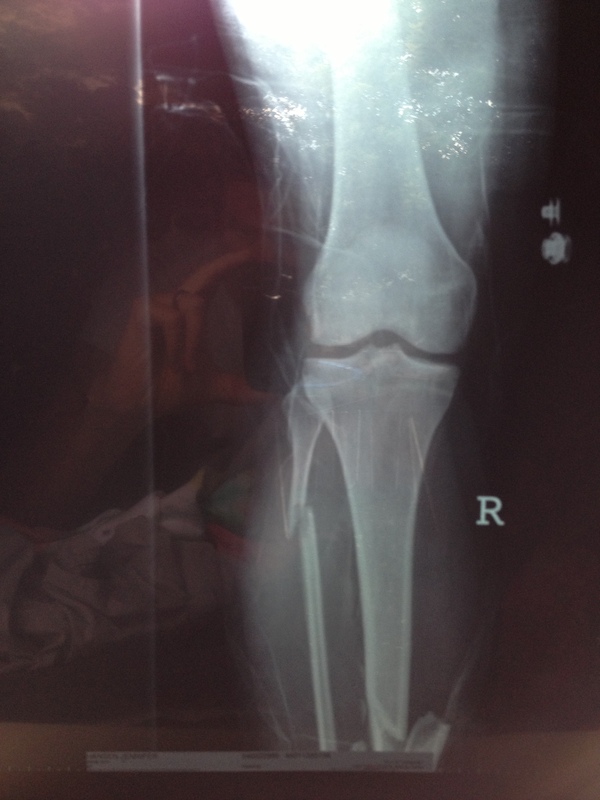 The trauma included the tearing of all ligaments in the left knee, two broken legs with one major compound fracture. As one could imagine, this put my running on hold. 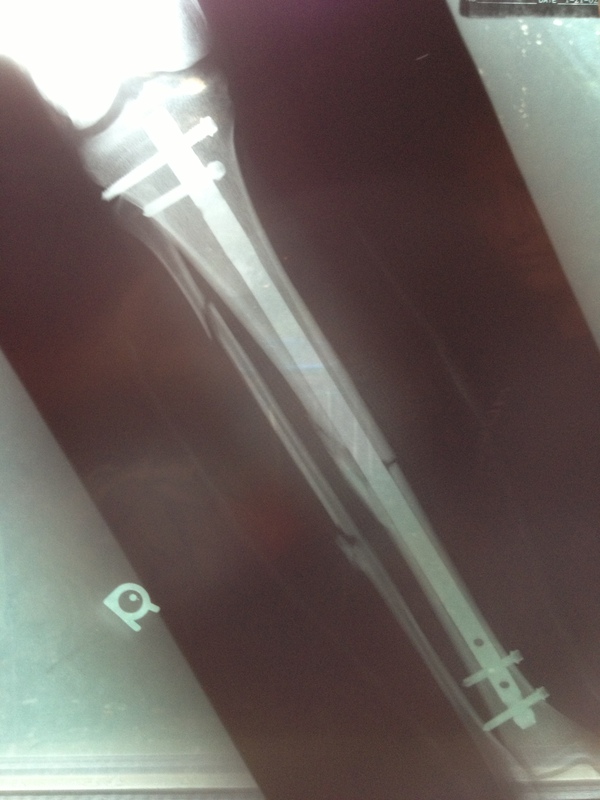 I was hospitalized for two weeks followed by four months of being wheelchair bound not to mention the massive rod hammered into my right leg. After the 4 months of being wheel chair bound, I had to go through therapy for a little over 7 months. It was physically, mentally, and emotionally draining. At times I became depressed and frustrated. I hated relying on people to help me use the restroom, shower, cook, dress, ect. I realized quickly that I could not have done any of this on my own. My family, my roommates and my dear friends helped me stay strong in more ways than one. (My mom came out to Utah from California and stayed here for 2 months to literally get me back on my feet, but that is a whole other story that I will write about someday!) I know I was truly blessed (even though at the time I didn’t feel that way). As I look back on this experience/trial in my life, I have come to realize how grateful I am that I went through this hardship, especially at this time in my life. I was able to find who I am. I relied on my Savior a lot! I also questioned myself everyday on why I stopped running!!! I missed it and craved it everyday for an entire year. When my doctor finally gave me the OK to start with “baby steps” I felt like I just won a gold in the Olympics. I gained a passion for running even before I was able to start running! It was a long uphill battle (I later found out that I am very anemic… and that was by trial and error). I finally found my rhythm at the age of 26 or maybe 27. Then I had my 4 kids (1st one at the age of 28) in 4 1/2 years, well almost 5 years. I was able to run through every pregnancy. Now here I am today wanting to bring the passion I have for running onto others (the high school kids I coach, the adults that I am coaching and all of you that will get on this blog and use it). I love running… it has brought me peace, excitement, nervousness, soreness, sadness, discouragement, disappointment, a sense of self, and accomplishment and because of all these emotions it has made me a better person. I didn’t know these things about you. Very inspiring! Holy! 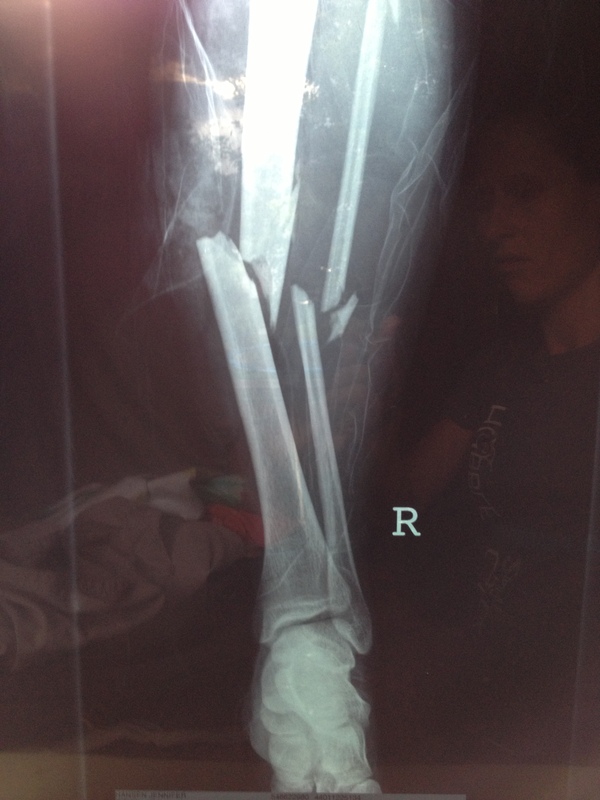 To think I have been whining for a year about a torn hamstring tendon…thanks for the perspective and motivation. You can still whine about a torn hamsting tendon. 🙂 Injuries are a pain no matter how minor or major they are! It tends to hold you back and that is frustrating, but a good learning experience. Love, love, LOVE this blog! What an inspiring story you have & I appreciate your passion for running. I’m a friend of Corom’s from CA/high school & he posted your link on FB. This is wonderful timing for me as I am training for the Ragnar Relay next month! I’ve had a hectic time trying to properly train since I’m a busy Mom with 4 kiddies too 🙂 But, after perusing through your blog I’m feeling more confident that I can make it happen & even PR in my next half marathon! Thanks for getting me pumped!!! Oh, BTW my name is Ashley…tell Corom Hi for me! I will tell Corom hi… What Ragnar are you doing? It does get really hectic with kids!!! Ragnar Napa Valley. We run from San Francisco to Calistoga. This is my first Ragnar, so I’m really excited! I love that you have a big support system of friends you can count on to train with you. I meet a bunch of girls from my ward at the gym pretty consistently. But, I’d seriously love to have you as a running partner. Thanks for sharing this blog with us! Corom was excited to see that you wrote. If you ever need a runner or 2 for your Ragnar team, let us know! We did just post our Ragnar video (Las Vegas) one on this blog on the featured videos. I do love running/racing! Keep me updated on how your training is going! Wow you are so speedy!!! I am just getting back into running after an injury but hope to cut my marathon time down by about 25 minutes. I have a lot of work ahead of me!